Part 1 wherein we go from Auckland to LA via Australia twice, having intended to do so only once. This is the journal of Steve and Jan's adventures on their third camping trip to Australia. The journey began on 26th of June 2003, but the story goes back much further in time. Two years ago we rented a Toyota HiAce Campervan and went on a 3 month journey around Australia. We didn't get all the way around in just 3 months you understand, but it was a good start. It was also an excellent escape from Auckland winters and we decided we like being gypsies on the road. So the next winter we spent about 8 days at the end of our "visit Jan's mother" trip by flying up to Cairns and picking up a Toyota 4WD Bushcamper and heading way up north into Lakefield National Park on the Cape York Peninsula. This took us along some of the route we had done a year before (Daintree National Park up to Cape Tribulation). On the previous trip we had to stop at Cape Tribulation because that is where the seal ended and the 4WD track began. We weren't allowed to venture off sealed roads in the HiAce Campervan, so we were looking forward to trying out the 4WD version. We had a great time and vowed to go for a 4WD next time even though they are much more costly to hire. We also vowed (loudly, to whoever would listen) to go for a longer trip because when we got back to Auckland it was cold and rainy and still winter. So 2003 was going to be another longer trip. We had visited Steve's mother in La Jolla (for those not in the know that is a coastal strip of beaches and bays north of San Diego) in February and she was saying it was time to sell her apartment and move into "assisted living". In her case this was partly to escape the noise and changed demography of the place her apartment was situated. In the 20 years since retiring there from LA, it had changed completely from a retirement community with owner occupiers, to a mostly rental place for twentysomethings who want to party by the pool. Most of her age cohort had already moved on to other places, leaving the twentysomethings to it. So the deal is, you put your name on a waiting list for this nice retirement resort called "The White Sands of La Jolla" and it usually takes a year for your name to come up, to sell your own place, and move in. We visited in February and discussed things further by telephone over the next couple of months. Given the timing we thought we would be very safe flying over to Queensland in late June and coming back in mid September. Much thought and internet research went into whether we should hire another 4WD camper, or buy one for ourselves. We arrived on the 26th of June ready to spend a week or two exploring vehicles and alternatives. We started out not sure that we wanted to buy, and this meant looking at a variety of alternatives. It seemed like a 4WD Van might be roomier than a Bushcamper, although it wasn't quite as roboust. Steve's main objection to the Bushcamper is that it is 2.7 m high (so that you have standing room inside) but this height always seems like a huge beacon which says "Tourist!" Basically, they take a Toyota Landcruiser Troop Carrier (affectionately known as a Troopy) and rip the top off and add a new high top in fibreglass. But after lots of looking, a Bushcamper is exactly what we ended up with and it is perfect if you want compact and robust. It is an ex rental vehicle, just slightly different from the one we had a year ago up in Lakefield. As soon as we tried it out it felt very familiar. The biggest difference is that being a few years later, this one has central locking, and they have added a bigger better ventilation hatch you can open at the top. All good stuff. We found this one through a nephew of Jan's mother's partner (no I can't draw a kinship diagram). It is the most expensive (and newest) vehicle we have ever owned, but it has proven itself excellent value so far. When you rent a 4WD camping vehicle the price for 26 weeks of renting is about the cost of buying. You wouldn't want to buy one if you were passing through Australia once and needed one for a week. Too much time spent buying and selling when you want to be camping. But for us it works out well. We have already had the experience from hiring so we know what we are doing (at least a bit), and that we enjoy the gypsy existence longer term. We have a place to keep the vehicle while we are leading our Auckland life, so we can own it for as many years as we like and then sell it on. And if we left the money in the bank it would earn a pittance compared to the ongoing cost of renting. So now we are the proud owners of one of those big 4WD vehicles that everybody else hates when they see them around town delivering kids to school or going shopping. We hate them too. But now we drive one. At least we don't have kids to drop off at school. In fact, our kid is quite interested in going driveabout in it herself. An aside: we didn't think we could call what we do "walkabout" because we drive, but we might call it driveabout. If it was NZ we would be Tiki Touring. So we bought our vehicle and were right on target in terms of time, taking about two weeks to get kitted out and ready to roll. But then we got a call from Steve's mother saying that a place at White Sands had come up much earlier than expected, she had an offer on her apartment, and could we come over. Now at this point we had a return ticket to NZ for some months hence, and an expectation that we would be doing a lot of camping. We did go for a little trip or two (more on this later), but we also headed down to the local Flight Centre to find out about the costs of going Brisbane-LA-Brisbane and keeping our existing return to Auckland versus some other combination. We ended up getting a fare on Air NZ which went Brisbane-Auckland-LA-Auckland-Brisbane. Although we were allowed to stop over in Auckland going both ways, we chose to stop for two nights just on the way back. Now back in February we had obtained a cheap fare to get from Auckland-LA-Auckland by going Auckland-Sydney-LA-Auckland. It took many hours longer but saved us a few hundred dollars each. That was our first experience at flying to Australia to get to LA. Now we were faced with doing it again, although this time it was an accident of timing. We were also offered a very cheap fare on China Airlines to get from Brisbane to LA, but we had to go through Taipei. We said "no thank you" without even finding out how low the fare was! So we had the strange experience of transiting in Auckland on the way to LA. Passing through your home town without passing through immigration and getting into the country properly. Our first shakedown cruise did not start auspiciously. We picked up the vehicle on the afternoon of Wednesday the 16th of July, and promptly headed off to a camping outfitter to get a few hundred dollars in bits and pieces. We needed a Coleman two burner stove, propane tank, two folding chairs, folding table, poles ropes and pegs for awnings. The material for the awnings was duly purchased with the rest and then taken to a sail maker down the road to have a bit of rope sown in. The Bushcamper comes with some rails (as did our Campervan the year before) but this was the first time we had ever used them. They provide shade or shelter from the rain so that you have an entrance and cooking area outside. An excellent addition to our kit. However, we were to pick them up the next day (Friday) at 4 pm. This meant rather a late start heading out of town into the bush. We spend Friday morning going to the local supermarkets to get provisions, cutlery, cooking pots, and so on. Then on to pick up the awnings and drop off our passports for photocopying by the car dealer to prove that we were us rather than somebody else. So we didn't get away until an hour before dark and we arrived at our first camping place after dark. There was much angst about finding everything since most of our gear and food had just been purchased and tossed in the back an hour or two before. But we made camp without incident, fed ourselves, and went to bed. Morning dawned and we found ourselves in a nice grassy area with kangaroos grazing around us, and Lake Cootharaba visible in the distance. The next day we vowed to arrive before dark so we could see where we were camping. But alas, our attempt to get to Harry's Hut in the Great Sandy National Park was thwarted by poor navigation and we ended up many miles out of our way, on the wrong road, and blaming the map for making no sense. 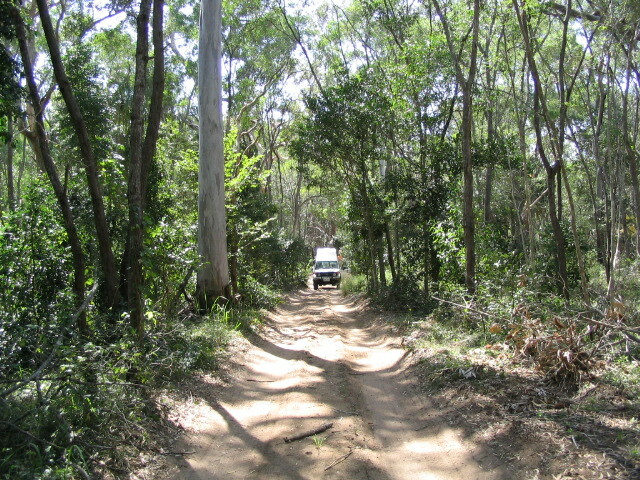 We spend lots of time following "permit only" Forestry roads and eventually backtracked and took a very long bumpy road for a different destination called Inskip Point. A very nice destination which we were planning to visit a few days hence, but it was so far that we arrived just on dark (again). This was a true 4WD campsite in deep sand nestled behind the fore dune at the beach. Lovely place, with dolphins just offshore watching us as we walked along the shore. This was the most northerly part of this first shakedown cruise. From here we headed back south in two short 4WD hops. The first was via a picnic spot called Bymien plus 2k walk to Lake Poona. The lakes in Great Sandy are like the lakes on Fraser Island (which we visited 2 years ago). The lakes (and the rainforest of large mature trees) are perched directly on sand. Incredible environment. There were also lots of colourful birds and animals. We had a particularly colourful local parked next to us. This somewhat disreputable panel van was parked next to us when we started to walk to Lake Poona. Upon our return I noticed it was still there but now the occupant was in residence, dressed in orange, burning incense, and meditating. Lake Poona was fantastic. Another party of 4 was just leaving as we arrived, and we were alone for the whole time we were there. The lake is fed by rain and goes up and down depending on when it last rained. We ate lunch on a little sand spit which juts out into the lake, which as a line of paperbark trees on it. We have since seen a few photos of the lake from other seasons when the spit is under the water and the trees have very wet feet -- but paperbarks like growing in swamps so they don't mind. After a snack we rolled on to camp a another lake closer to the beach. This one was called Freshwater, and it was a very well appointed National Park Campground. It even offered hot showers! Most "developed" National Park Campgrounds offer a composting toilet, some add a tap with water you can drink, but this one was real luxury. It also revealed an interesting aspect of signing old and new, which became a theme with the Queensland National Parks during this trip. Hot showers cost "$1 for approx 4 minutes (including Goods and Services Tax)" we were informed. GST was recently brought into Australia and has caused any number of grumbles and quirks. We are used to it because it was fairly painlessly brought into NZ some years ago. What we noticed upon closer inspection of different signs (of different ages) is that it used to be "$1 for 5 minutes" and rather than "approx 4 minutes". The law brining in GST forbade firms sneaking in price increases at the same time, but the Park Service didn't want to end up having to collect $1 coin plus one 10 cent coin, so they just fudged the time. A practical bush answer to a dictate from the city -- but then they could have just lowered to price to $1 for 5 minutes including GST if they wanted to. Maybe it was water conservation they were pushing for. 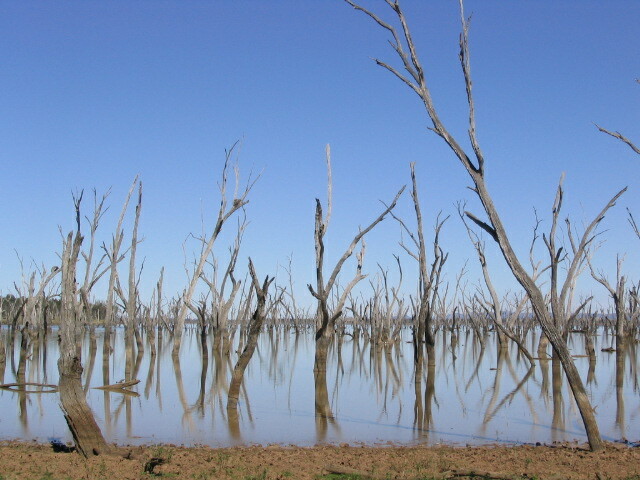 Water is in short supply in Australia, but this area is actually well watered. That's why some rainforest survives. In fact we had a little sprinkle in the night, just enough to keep the dust down on the unsealed roads. The next day we had a walk from Freshwater Campground up around the lake itself (a few k). We saw a pair of whip birds playing around which was a rare treat. We hear whip birds far more often than we actually see them. They like to hide in dense scrub. Then we drove back out from Freshwater and headed for the road to Harry's Hut...this time from the North. We had already spotted the sign so we knew where to turn. The road into the Hut was challenging with some up to the axle mud wallows, but our Troopy wasn't worried (even though Jan was at first). We had a walk in the afternoon light at Harry's but turned back when it started raining on us a little. Yes, more evidence that this part of the Queensland coast is well watered. We still had time to spot a Pale Yellow Robin and a few honey eaters on our walk. Harrys's Hut campground has far more people who arrive by canoe than 4WD. 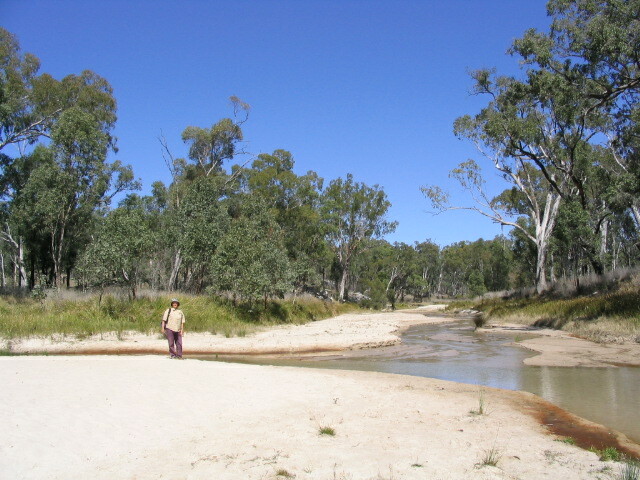 It is one of several camping spots along the upper reaches of the Noosa River. In fact, this National Park has the only visitor centre I have heard about which you canoe to rather than walk to. I think there is a track but it is quite a big hike. The next day we drove back to Nambour, but we had a nice long walk on the way starting out on Beronia Walk and ending up at KinKin Creek. We also stopped along the way to check out where we had gone wrong in finding the turnoff the Harry's Hut on our first (failed) attempt. It turned out to be just a missed turning. So we zoomed into Nambour and paid for our tickets to LA, and spent the night in a real bed in a real house. The next day we took on supplies and headed inland a little way to Charlie Moreland Campground. This is a place we had been to just a week or so before on a picnic outing. That made it an easy destination since we knew where we were going. We were making our way West (inland) and a bit North, heading for a place called Cania Gorge. The Charlie Moreland Campground was on a back way which took us off the main roads in favour of smaller ones, and turned out to be much more direct. Some parts were sealed and some were unsealed. The sealed parts were in a variety of forms including the single lane with just unsealed shoulders to pass on when you meet another vehicle. And just when you think the road will be sealed for a time, it evaporates and leaves you on the rough surface again. Perhaps the variety of sealing is why in one place we saw a very official properly printed road sign warning of us a "Consealed Side Road". Consealed or confused, we made our way towards Cania Gorge via the Bunya Mountains National Park. 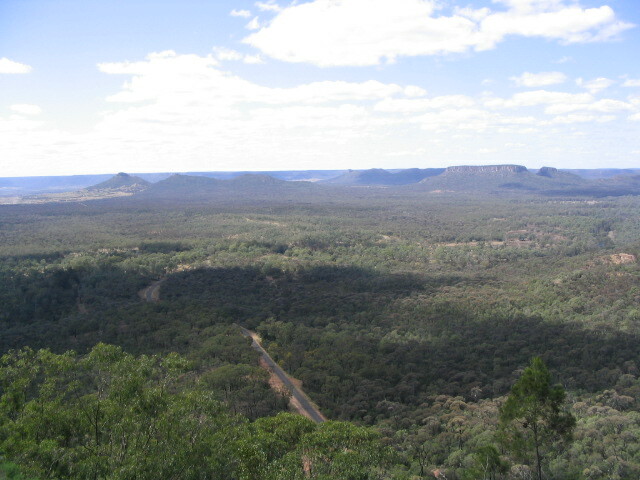 The Bunya Mountains are a high altitude remnant of the older rainforest, and are up on a plateau with very steep sides. The road signs mention no trucks, trailers, or caravans and when you get to the vertical bits you can see why. We stayed in Dandebah Campground which is a small grassed area with a toilet and shower next to the National Park Ranger Station. Apparently you have to book months ahead and stay in private places in the peak season but not at this time of year. We found out why. It was very cold and rainy. We wore all our clothes (and kept a layer on in bed) and I had to wear a pair of socks on my hands because they kept going numb. We had a walk in the afternoon and the next morning, but decided not to stay another night. Too cold and wet. But gorgeous and another one of these very unusual environments left from before Australia dried out. We saw king Parrots galore, and herds of Red neck wallaby and bower birds grazing near our campsite. We also came across a dead bandicoot which we reported to the Rangers. They came and collected it in a plastic bag and identified it as a brown rather than a long nosed. Any bandicoot was interesting to us. The next morning we went down the hill in search of warmth and as we went down off the edge of the plateau we passed out of the cloud and into sunshine. We travelled on and stayed at Barambah Bush Caravan Park which was nice and where we could have a fire. This kept us a little warmer, so we stayed out for a while before heading into bed. The next day we warmed up with eggs and bacon cooked over the fire on a big flat bit of iron. Very rustic. Then we headed off to Wondai where we bought some warmer things in the Opportunity Shop. We spend $8 and got warm pants and a wool hat for Jan, and two long sleeved cotton bush shirts for Steve. Plus we got a long skewer for toasting marshmallows. Later in the day we returned to our Barambah Bush camp and blew on our fire to bring it back into life. Then we cooked some steak, sausages, and onions which we had purchased that day. When in beef country, live like the locals. We headed off the next morning hoping to get to Cania Gorge but didn't make it. On the way we spent some time on a walk a Boat Mountain. Then we were held up by an accident and as it was getting late in the day we decided to stop in Mundubbara. We checked out the Big Mandarin Campground (it is a citrus growing area and they have an office shaped and painted like a mandarin accurate right to the two leaves and stem on the top). The one space they had left wasn't very nice, and we headed off down the main street to another pace which cost more but was a bit nicer. Days in Mundubbara are warm because of the sun, but at night it was no warmer than the Bunya Mountains. The only difference is that since there are no clouds it does warm up during the day. Steve left out water in the kettle and it was frozen on top in the morning. Fortunately our $8 additions to our equipment kept us warmer. Like reptiles, when it was too cold in the morning we just waited for the sun to warm us up. Alas that reduced the number of daylight hours available for travel. But we did reach Cania Gorge for lunch and had a nice walk on a short track. On the way from Mundubbara we saw a free camping spot which we would have enjoyed if we had continued on. It had the rather un-Australian sounding name of Ceratodus. Later on we found out about the name. In the 1840's a farmer called Foster was at a Natural History Museum (in Sydney or Melbourne we don't remember which) and he saw a display of a million year old fossil lungfish. The reconstruction looked awfully like something he liked to catch and eat in his local Nogo River. So he caught one and sent it to the nice bloke at the museum, who identified it as a previously thought long extinct Ceratodus. Slight anatomical differences lead to its later classification as Neoceratodus fosteri. And that's why this free camping area has such a seemingly out of place name. You aren't allowed to catch them any more but they say they were good eating. We stayed two nights in Cania Gorge and enjoyed the walks. It does seem a kind of a sad environment because some years ago they built a dam upstream of the National Park (at the boundary in fact) which has never completely filled and it doesn't allow much water to run in the creeks which used to have a bit more water. For a long time it was only 7% full and there was much excitement when a few big downpours got it up to 60%. For a time. It is a reminder of the difficult time with conservation and development they have in Australia with its harsh and unpredictable climate. We headed off towards home base the next day and stayed overnight at a little camping site called Mudlo. After the Ceratodus experience (try and find the little local places rather than the town commercial campsites) we were feeling like taking more risks so we travelled on smaller back roads. We were on a lovely narrow little road for about 40 or 50 k when we came across a sign saying "Road narrows", after which the road was the same width as far as we could see. Now given that you couldn't have been in a position to see the sign unless you had already travelled the 40 k of narrow winding road, one wonders why the signing people suddenly decided that it was time for a sign. It reminded us of the sign seen after hundreds of ks of travel on back roads with unfenced cattle wandering around when we came across "warning: cattle on road". Yeah, right, we had worked that out. But back to the "Road narrows", after watching the road for a time we figured out the pattern. There was a single lane of seal most of the time, but at blind curves (it was a little hilly) they would widen the road ever so slightly and put a line down the middle. We guess they thought these were the most dangerous spots. And the "Road narrows" sign turns out to be at the place where there is a straight but narrow cutting through one of the hills thus no shoulder to move out on if somebody meets you coming the other way. The sealed strip doesn't get any narrower, but there isn't a shoulder. Fortunately, we didn't meet anybody in 3 hours so this was never an issue. After a very pleasant back road wander, we stopped in a the little village of Kilkivan and asked at the pub about a place we might camp. That's how we found lovely Mudlo, which included a toilet, and table and shelter, and a fireplace with the wood stacked and ready for us. Thus we spend a happy last night all on our own, before we headed back to civilisation. So in the end, we went from camping by ourselves in the Australian bush to LA in one very long day. What a culture shock. But that is another story for another day. This unusual lake is Nuganuga which formed naturally over the last 100 years thus is still filled will dead trees. The trees provide homes to lots of birds although they will eventually rot down. This picture shows our Toyota Landcruiser Bushcamper (called "Trevor the Troopy") on a track in Euriembula National Park on the coast. The ocean is not visible in the picture, but then you can't see 5 meters through the tangle of vines. We had to wait for snakes and goannas as we were travelling along, plus dodge the occasional wallaby. You can also spot the stick in the foreground pretending to be a snake or goanna so we won't run over it. Those sticks did that a lot which meant that we had to keep a constant watch for the real thing. The only down side of this area was lots of very tiny "stealth" sand flies which gave us hundreds of bites. Unlike NZ sand flies these are so small you can hardly see them, and you don't feel the bite at the time. But the swelling and itching the next day is just as bad as the NZ ones. I'm sitting here covered with bites several days later. In the same way that a Troop Carrier is a Troopy, the Aussi language creates a number of great diminutives (which we honour by calling a dimmy -- although some may argue for spelling it dimmie). We are collecting a few along the way which tickle our wordsmith nature. For now, we note that Canteloupes (Rock Melons) are advertised at a roadside stand as "Rockis". They can't be Rocky because that is the dimmy for the city of Rockhampton. We hopped off a long plane trip to LA and picked up a rental car on the afternoon of Friday August 1st. That meant driving to San Diego before the big commute happened and things got real slow. Once again we were helped by the Car Pool lanes on the freeways. All they ask is that you have 2 people in the car, but that is enough to exclude about 90% of the traffic. So we whistled along in our shiny red Pontiac Vibe until things got real slow 30 miles or so out of San Diego where all those other beach communities are. We could see ahead far enough to observe huge lines of traffic, and opted to get off and try our luck on the old Pacific Coast Highway. We didn't expect it to be any faster, but it would be more scenic. Similar considerations arise in picking our route in Australia, although the details are a bit different. In Australia there are many places where there is a more "direct" route which is shorter in distance, but is such a poor condition unsealed road that it takes longer than the less direct sealed highway. But we often choose the unsealed road because it takes us through more interesting places. In Southern California there are freeways (limited access highways) which are often direct but clogged up. The older scenic routes are slower by nature, and tend to have less traffic because most of the drivers are sitting in a queue on the freeway. So off we went on the old Pacific Coast Highway wending our way slowly from town to town. We passed through familiar places like Solana Beach and past the Torrey Pines State Park, and eventually ended up chez Betty Black in La Jolla. One of the interesting things we saw along the way was a long strip of camping (all full up) which in position was analogous to the coastal camping we had been doing around Southeast Queensland. Except that there were thousands of people where we were used to a dozen or so. It was full on summer and the surfers and beach bunnies were out in force. The California dream. The next day Jan came down with a terrible illness. She had been setting behind a guy from Christchurch who was all stuffed up with something and snored terribly. Steve was in the next row behind and apparently out of range of infection. Either that or his immune system is finally up the scratch again. So after the long trip we were both stunned mullets the next day, but Steve got better while Jan went downhill rapidly. Our worst fear was that Jan would pass it on to Betty who does not fare well with colds and flu. And we needed all our strength for the moving Betty to her new place. The next day Jan was much worse and Monday morning she was taken by red Vibe to an emergency medical place. Well, she waited two hours for a 5 minute consultation and a prescription for some fancy new antibiotics. That cost about $NZ150, and the pills another $NZ100. As those of you from civilised countries will realise, this was a bit of a shock. We put Jan on strict quarantine (strictly own glass and eating utensils, although we stopped short of a SARS style mask) and neither Betty nor Steve came down with it. Whew. We were all relieved when the high fever broke after a few days, but Jan remained unwell for much of our time and studiously avoided contaminating others. Before getting too sick Jan had started the process of going through some of the stuff which Betty had to consider for the move. Amazing how much you can accumulate in just 20 years in one place. Basically we had to create 4 different piles: move to White Sands; throw away or recycle; donate to a good cause; take to NZ. Over the next week and a half we created and moved various piles in various configurations, and all the time we had our eye on Moving Day which was the 12th of August. We made it, and managed to get everything in the correct pile. Jan was project manager and Steve was mover. We did things like make a scale model on graph paper of the new place and where things like bed, desk and cabinet were to go. It proved that we could fit some things which Betty had been reluctantly leaving behind. It also proved a great hit when we provided it to the professional movers who came on the 12th to move the big things which couldn't fit in the red Vibe. We mention the red Vibe fondly because although we just took what came from the rental place (we don't know nuffin' about Yank tanks) it turned out to be very flexible and just the right thing for moving. It was a station wagon and you could fold the rear passenger seats down in seconds, and the front passenger one as well for long things. Steve made dozens of trips back and forth in various configurations: driver plus full cargo; driver plus one passenger plus three quarters cargo; driver plus two passengers with half cargo; driver plus three passengers with quarter cargo. Mostly the word was cargo. We also had a donation fest with lots of books going to the public library; kitchen equipment and food going to a soup kitchen connected to the Church Betty belongs to; sofa and some chairs going to the Mexican cleaning lady; and distribution of a few choice items to neighbours who had been invited to put in expressions of interest. And Steve and Jan didn't get away unrewarded in the cargo department. Steve used his experience in shipping home an entire drum kit as part of our luggage last February to create boxes and get every last kilogram and square centimetre of our free luggage allowance. Everything we took arrived safely thanks to liberal use of bubble wrap. Oh, and there were just a couple of snare drums (one new and one from the 1950s) which Steve picked up while he was there. So our hand luggage amused the x-ray people because one of us had a large cut glass vase, and the other one an equally large Japanese vase. The new chez Betty Black is quite amazing. It was built right on the beach in La Jolla as a fancy motel in the 1950s. Architecturally it feels just like a motel resort in every detail...the long corridors with lots of anonymous doors, swimming pool and spa, dining room with glassed in outside dining overlooking the beach. The company who built it folded just 7 months after completion and it was bought by the Presbyterian Church and has run as a retirement residence ever since. The last three nights in La Jolla we stayed in a spare apartment in White Sands. They have a few rooms set aside as guest accommodation, and also make use of rooms where the occupant has temporarily gone away for a time. The White Sands is "high class" and the residents have even given themselves a dress code. Gentlemen (and they are all gentlemen and not just males) a tie or coat for the evening meal. Both for Sunday lunch and Saturday night. Fortunately they let guests come as they are. This was a good thing. Having come directly from the bush in Australia, all Steve had was one pair of jeans, shorts, and t-shirts. Rather underdressed, but all was accepted with good grace. The people who look after the place are incredibly friendly and helpful and it seems fabulous. Many are Mexican and speak Spanish among themselves but fluent English when dealing with those who are not bilingual. Betty was always unsure about going there because she felt it was too "gussy" and beyond her means. Fortunately, the skyrocketing prices for apartments meant that she could sell her place and buy in to White Sands and continue to live comfortably on her retirement income. Betty was also reluctant to give up cooking for herself (this is a woman who still baked her own bread at 89) but recognised that the time had come to relax and enjoy not having to go shopping and cook. The other great thing is that Betty already knows many other people who are there, and her new neighbour is also her old neighbour from her old place. Bill moved out about half a year ago and paved the way. He continues to look after Betty, giving her insider information like the fact that there is a very good chilli available on Wednesday at lunch time, but it never appears on the menu. All in all this seems an excellent move, and a good escape from Capri Aire which has turned into a young persons party place. We got an earful of this ourselves while we were there. Because mobile phones get poor reception inside the twentysomethings stand around on their patios or by the pool at all hours talking on the phone. Then there are the late night parties on Friday and Saturday. In contrast, the sound of the sea takes you gently to sleep at White Sands, and workers are required to stop have siesta from 1-2 after lunch each day when it is "quiet time". At the end of our stay we hoped to visit with Rick in LA and Mark up the coast at Camarillo. Alas, it took far more time and energy than expected to do the moving, so we just went as far as LA and had a mobile phone conversation with Mark in the middle of Farmer's Market in LA. Jan was also still being very cautious about infecting people just in case and she wanted to spare Judy (Mark's very pregnant wife) any chance of getting sick. So Rick and Steph went with us on an outing to the LACMA (LA County Museum of Art FTNITK (for those not in the know)) and then the aforementioned Farmer's Market...which keeps the name although I don't think a real farmer has been there since long before Steve first went there in the early 1960s. We had to fly back to Australia to meet up with real farmers. Yes they still have them in California but not where we were this time. Another long flight but this one was followed by a short trip home rather than several hours more driving to arrive at our destination. This flight was also more pleasant because we had learned the method for getting a whole row each for sleeping. On the way over to LA we had been put right at the rear of the plane and the travel agent said that if the plane wasn't full this gives you the best chance of grabbing a row for yourself. Alas, on the way to LA we waited until the door was closed before shifting seats and by then the rows were taken. This time on the way back we knew better and we jumped in and defended our territory as soon as we got on. We both had a good long sleep on the way. Alyx met us at the airport in our car. This is the first place where our "maximum luggage allowance" plans came a little unstuck. When we tried to fit the three of us in the car along with all our boxes it was no go. So we had to unpack one box and put the contents in the gaps which were left. This left us with a box and a bunch of packing materials to dispose of. We looked around but couldn't find any place to put it so we ended up leaving it in the airport parking lot and slinking away guiltily. We had two nights in Auckland and then were off again to Queensland. It was good to catch up with a few people (not everybody because we were short of time, so don't be offended please), sort through the huge pile of mail which had accumulated and pay a few bills which needed paying, and pack up a few extra items for the Queensland trip which we wanted to add to our kit. So two weeks after we left we were back in Queensland. This time we intended to explore more of the environment we had been looking at in Cania Gorge. 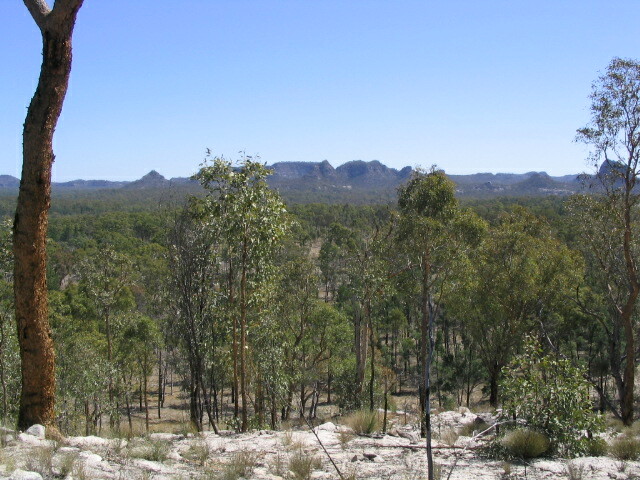 Cania is one small piece of an extensive belt of heavily eroded sandstone which forms part of the Great Dividing Range in Queensland. Because it is so old, this range has eroded way down unlike the Rockies in North America. Low and eroded it may be, but the Great Dividing Range still marks the place where rivers on one side flow East and rivers on the other side flow West. Except that the Great Dividing Range is right near the East Coast of Australia rather than closer to the middle...and some rivers go North and some go South, and it all gets kind of tangled up in the middle so that some never go near the sea. I refer you to your atlas. Off we went to explore more of this area, visiting Canarvon Gorge National Park where we spent 3 nights in the Gorge itself (the most well known area) and then a night at Lake Nuganuga, two nights at the Mt Moffat section of Canarvon National Park, a transit night at a little town called Injune (although by now we were In august), a night at Expedition National Park, a transit night in Rolliston (where we dined out at the Corregated Cafe); a night at the Ka Ka Mundi section of Canarvon; two nights at the Salvator Rosa section of Canarvon. Although the different sections of Canarvon are all part of one park, you have to go up to 3 hours on rough unsealed roads to get out of one section, move around the part on a sealed road for some hours, and then go back in again on another rough unsealed road for 3 more hours. The public only get to nibble at the edges of these remote places. But they are fabulous. In the gorge itself we booked in on a night spotting eco-tour. Australian fauna is divided into a night shift and a day shift, and in order to get to see any of the night shift you have to be out after the sun sets. The kangaroo and wallabies are out as the sun is setting and stay up for an hour or two after sunrise, but mostly they leave the day to the reptiles and birds. The possums are strictly night shift, as are most of the small mammals. The monotremes (Platypus and Echidna) were out for us to see them in the gorge during the day, but special effort was needed to see those possums, and we were especially keen to see some gliders. 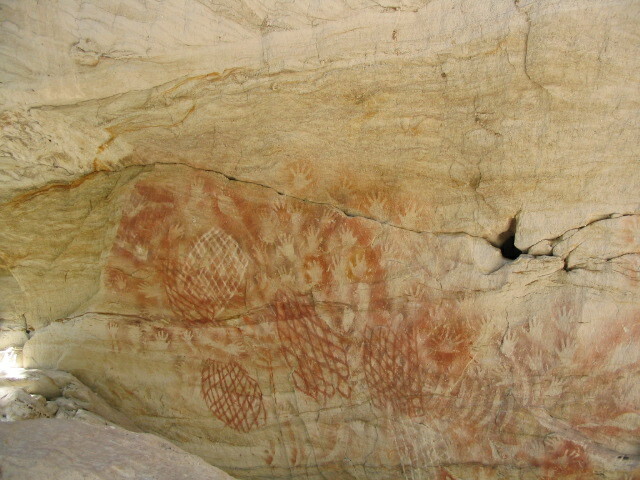 Canarvaon gorge has 5 of the 6 species of glider possum. After a not very satisfactory night spotting trip up in Daintree a year ago we weren't expecting too much, but we struck a great night. We saw yellow bellied gliders and greater gliders. The yellow bellied gliders were busy ripping bark off a tree and scattering it all around. This all happens way up in big old trees. These have the holes the possums sleep in during the day. What you do to see them is show up at night with a very powerful light beam with a red filter on it and you point it up into the trees and have a look. Since our experience on this eco-tour we bought our own spotting light although we haven't charged it up and gone looking yet. The red filter allows you and the possums to keep their dark adaptation and not get dazzled. We also got to see a Tawny Frogmouth and a Boobook Owl, and saw several "micro" bats flying about getting the insects we were stirring up. The only thing we didn't see is a glider doing its gliding thing. The gliders are like North American Flying Squirrels, and when they want to change trees they glide from one to another by tightening a membrane which runs between front and back feet (yes this is the simplified version). By day we traversed the same area as the first part of a 22 k walk up the gorge followed by a meander back looking at the attractions in the side gorges: amazing narrows, ferns, waterfalls, rock art, and so forth. We were pooped afterwards as it was a pretty long day. Once again there are lots of wet areas in the gorge which continue to be a refuge area for the "old" flora and fauna from before Australia's climate shifted and things got so dry. In fact, the Canarvon area is called the "roof of Queensland" and it contains springs and the headwaters of at least 8 major rivers which head off in different directions. We saw these amazing springs and gorges heading in different directions when we visited the more remote upper sections of the park at Mt Moffat, Ka Ka Mundi, and Salvator Rosa. In Salvator Rosa we met up with some bushwalkers who were there for a week going cross country with topo map and compass. They warned us about small bush ticks which seemed to float down from the trees or on the breeze and attach themselves to you. Over the next few days both Jan and Steve found a couple each and they were duly removed by the recommended method: unscrew them counter clockwise (anticlockwise). In one extraction the head broke off leaving a bit in Jan's leg. A red lump appears for a few days, but this was lost among the hundreds of red lumps Jan had after the stealth attack of sand flies when we got to the coast. On the way to our rendezvous with the sand flies we stopped at another part of the sandstone ranges called Blackdown Tableland. We were warned that it had suffered a major fire from lightening strike about a year before. When we arrived some trails were still closed, but the vegetation had recovered and we were treated to very lush re-growth and lots of things in flower. There were lots of bids about, but we didn't see and kangaroo. They might have cleaned out and not yet re-colonised the area. On the way out from Salvator Rosa we stopped at an interesting road side rest area in the middle of nowhere. It had a covered picnic bench and the roof collected rainwater into a small tank. There was a very rustic billy hanging on the tank which had a barbed wire handle. Obviously you are expected to be careful with it, especially if you are of the pursuasion to swing it vertically to settle the tea leaves. There was also a recently planted tree with a sign "Water Me", so we did. People really look after trees in this area because after years of clearing they have come to respect what the original tree cover did for the environment. Locals also seem to particularly like bottle trees (an endemic unusual tree form which has a nice big bottle shape to store water and a fringe of branches and leaves on the top -- not to be confused with the African derived Boab (or Baobab) tree which is found in the northern area of Western Australia). Often you will see a hillside of Bottle Trees where all the rest of the Eucalypt forest has been cleared for pasture but the Bottles are left behind. Big Bottles were also important for the early European explorers who carved their initials on them as markers, and left stashes of provisions buried near them. We visited one "Dig Tree" which had been inscribed by Ludwig Leichardt while passing through the tiny town of Comet. Leichardt was responsible for a lot of names in this area and he seemed to wax astronomical for a time so we saw: "Planet Downs", Arcturus, Meteor Creek, and the like. Another place name we particularly relished was the tidy little town of "Dingo" from which we rang Steve's mother. We have gone bush camping in National Parks for most of our time here, with occasional stopovers in commercial "caravan parks" as needed because of distances. In the small towns we are always impressed with how friendly people are, and get good local maps and information from visitor centres and the like. Injune even runs a free caravan park (free for the first 2 days, $5 a night if you want to stay longer) with showers and a washing machine. Thank you Injune! We headed for the coast on the Capricorn Highway, but turned south on the Burnett Highway rather than coming out at Rockhampton. This was as North as we got this time -- nearly in the tropics. On our way back to the coast we stopped in for supplies in Biloela where Jan was muttering to herself while walking down the isle in Woolies "I wonder where the towels are?" and she got an answer from a smiling and amused person restocking the isles. Once on the coast we headed for several National Parks South of Gladstone after checking on directions (and getting local knowledge) at the Information Centre. Our first port of call was Euriembula National Park (the photo of the first part was taken on the road in to Bustard Beach campground). This campground was complete with all sorts of birds (and the insects but we won't go on about them again). There was a fig tree which was in full fruit, and there was a constant sound of birds squabbling amongst themselves (or just saying hello?). We got to see Figbirds (Sphecotheres viridis) and the usual honeyeater suspects. On the way out we also saw a brightly coloured Rose-crowned Fruit Dove (Ptilinopus regina) which crossed our path on the 4WD track. We do well identifying the very colourful and exciting birds, we still aren't so good on the "little brown jobs" which have few distinguishing features and flit about in the treetops far above. You also don't get any photos of these birds from us. We haven't got the special equipment -- they would just be fly specs in the frame. The next day we did a long 4WD sand trek through Deepwater National Park stopping for lunch and walks at various places. In doing this area we were completing a loop which we hadn't quite closed two years earlier in our very first 2WD trip. There was a small stretch of unsealed road which saw us backtrack for a couple of hours in our HiAce Campervan rather than venture onto unsealed roads. We learned more as we travelled around the outback! And this time we hardly noticed the unsealed stretch as we trundled along. We made our way to Burrim Coast National Park South of Bundaberg, and camped at another 4WD only sandy campsite on Burrim Point. There was one other couple in this isolated camping area, which featured outdoor showers (unique on our trip this time). From the beach on the point we could see the north part of Fraser Island and knew that we were just about back to Nambour again. The first shakedown cruise on this trip had us at Inskip Point which is just to the south of Fraser Island. One more adventure awaited the next morning. Rather than go back out of the National Park the way we had come in, we took a 4WD track which went around the other way to complete a circuit. We had to check with the locals about the beginning because it wasn't even signed. But it was a lovely little track, and teeming with Rainbow Bee Eaters. We had not seen these bright and acrobatic little guys on this trip, although they were our companions on much of our long trek across the North two years ago. At lunch we called in at what was a most unexpected picnic table in the middle of nowhere off the 4WD track called Hoppy Lark Creek. It was built for handicapped so it had a large deck on poles looking out over a river. The table had short benches to make lots of room for a wheelchair to pull up at one end, and there was a sealed path for getting the wheelchair to the deck, and down to another overlook for the water. Mind you, to get to the sealed path you would have travelled 20 k of sand in a 4WD and then pushed the chair from where you park in soft sand over to the sealed part. But it put us in mind of a German couple we had met two days running who had the same kind of high top camper as we did. The woman was in a wheelchair but was able to drive with hand throttle and brake. They had come all the way from Darwin. Meeting up with them gives us a sense of perspective about what is possible in this big wide world.